As I sit here writing this, the hurricane has not really begun yet. It is early Sunday morning and the wind has just started to pick up. I must confess that hurricanes scare the crap out of me. The very first one I ever encountered was in 1996 and I had just moved from St Louis to Virginia to a town where I knew no one. That was some kind of scary. The wind howled all night-it's the sound of the wind that gets me. I hate that sound. The next day was to be my very first day as a new RN. I remember driving in the hurricane, scared to death, but didn't think I should call in on my very first day. Turns out a lot of people did stay home and I was thrown to the wolves so to speak and instead of orientation, I was expected to just do the job. I guess I made an impression because not long after that, they made me a charge nurse for the second shift. But that's another story for another time. This storm is looking to be something fierce and scary. Perfect for a full moon day and Halloween eh? I just hope I don't lose power. That's not ok with me and once again, as a nurse, I am expected to be at work regardless of the weather. So I will be driving through the worst of it Monday and Tuesday to be at work. I would rather stay at home with my cats and make sure my house is safe. Am thinking my crooked leaning tree that withstood last year's hurricane may finally fall during this hurricane. 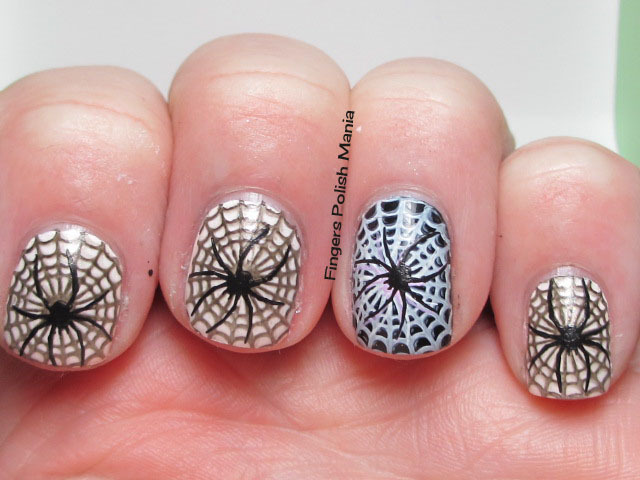 As you've seen, I really haven't done any Halloween manis this year. I think it is because last year's was so awesome in my mind that I didn't want to do something less spectacular. If you want to check out what I did last year, click here and here. I am hoping you think this year's is just as cool. Holy Crap-a-moly! That's a buttload of polish right? Check out the colors of the leaves in the background! This is Orly Liquid Vinyl, Lime Crime's Pastelchio, Crema de Limon, Peaches Cream, Once in a blue Mousse and Lavendairy. Then Bettina Marshmallow and finally Picture Polish White Wedding. Now I started with Marshmallow with a layer of White Wedding for sparkle and an accent of Liquid Vinyl. Now with the hurricane planning on being here for days, I really won't have any sun shots for a bit. Here is the first step. Unfortunately, the White Wedding can't be seen without the sun. I meant it to add the sparkle you see on spider webs in the dew. Oh well. Next I stamped using plate SDP-N. Here is that step. I did use Vinyl for the black and it came out greyish. I used Sally Hansen Whirlwind White for the black nail. The greyish actually worked to my advantage. I next stamped using MASH 38 and Konad Special Black. Here is that step. If I had used the same black polish, you wouldn't have seen the spider. Isn't it creepy looking? I seriously can't look at my nails right now! 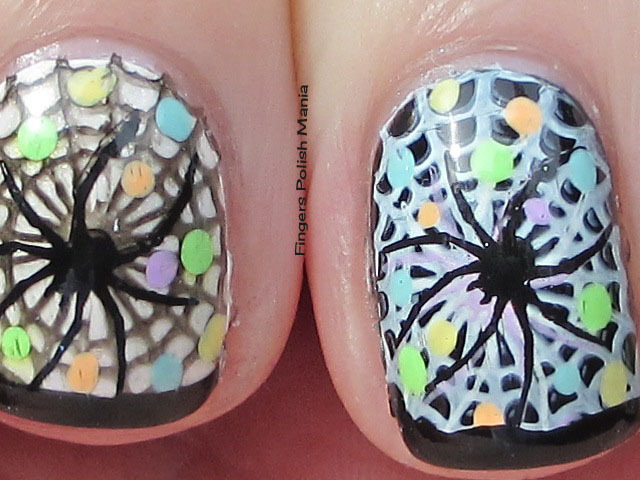 Then I added pastel dots or "bugs" like the ones you find on spider webs. Here is that step. Man that spider is creeping me out!!! I finished this mani with my funky as always using Liquid Vinyl. Here are the glorious results. Is this not the coolest thing ever? 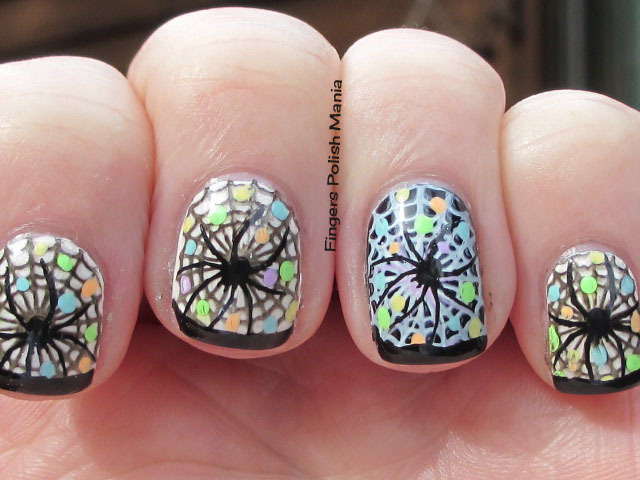 I'm thinking that the accent nail is a little better than the rest, but still overall this is one cool mani! That spider is creeping me out and every time I look down, I think there is a spider there! Please cross your fingers that the hurricane doesn't wreak too much havoc on the East Coast and that I don't lose power! Until next time. Any thoughts out there?